Intramolecular forces (bonding forces) exist within molecules and influence the chemical properties. Intermolecular forces exist between molecules and influence the physical properties. We can think of H2O in its three forms, ice, water and steam. In all three cases, the bond angles are the same, the dipole moment is the same, the molecular shape is the same and the hybridization of the oxygen is the same. 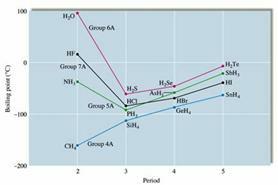 However, the physical properties of H2O are very different in the three states. As solid ice, H2O possesses a definite shape and volume. It is incompressible. Liquid water possesses a definite volume, but will assume the shape of its container. It is slightly compressible. Steam will assume both the shape and volume of its container and is extremely compressible. Intermolecular forces (IMF) are the forces which cause real gases to deviate from ideal gas behavior. They are also responsible for the formation of the condensed phases, solids and liquids. The IMF govern the motion of molecules as well. In the gaseous phase, molecules are in random and constant motion. Each gas molecule moves independently of the others. In liquids, the molecules slide past each other freely. In solids, the molecules vibrate about fixed positions. The transitions between the phases, phase changes, can be viewed in terms of a Heating Curve, like the one shown below, for water. It is a plot of time versus temperature. The time axis represents the addition of heat as a function of time. The longer the time span, the more heat has been added to the system. In this Heating Curve, we are starting with ice at -20oC. As we add heat, we raise the temperature of the ice. The heat that we are adding is increasing the Kinetic Energy of the system (KE = ½ mu2) which is proportional to the absolute temperature (K) of the system. In the solid phase, the allowed motions are in vibrational movements within the molecules. In the case of water, the O-H bonds are stretching and bending. The bond lengths and angles are oscillating around the predicted values. The amount of heat required to raise the temperature of the ice is determined by the heat capacity of ice, the heat required to change the temperature of 1 gram of ice by 1oC. The heat capacity of each phase of each substance is unique, and depends on the chemical nature of the substance. When the temperature reaches 0oC, the melting point of ice, further addition of heat does not change the temperature. At this phase transition temperature, the added energy goes to changing the Potential Energy of the system. This is the energy associated with the IMF, which are holding the H2O molecules in the solid state. It is coulombic in nature, arising from the attraction of charged species. In the case of H2O, it is the attraction between the partial positive charges on the H and the partial negative charges on the O. As we discussed earlier in the semester, these are hydrogen bonds, holding the water molecules in the crystalline structure of ice. At the phase transition temperature, 0oC, all of the ice will be converted to liquid water. As soon as the phase change is complete (s ® l), addition of heat will then lead to an increase in temperature of the liquid water. The increase in temperature is, again, an increase in the KE of the system. The movement of the water molecules will increase in the liquid phase. There is still some degree of hydrogen bonding between molecules, but they are no longer in fixed positions in a crystal lattice. There is a second phase transition at 100oC. At this temperature, the water, at 100oC, is converted to steam at 100oC. The remaining hydrogen bonds are broken, and all of the water molecules are now moving independently of each other, with no remaining hydrogen bonding. The liquid water is converted to steam. As soon as this happens, addition of heat raises the temperature of the steam and increases the average kinetic energy of the gas molecules, as predicted by the Molecular Kinetic Theory. The heat of fusion (heat required to melt a solid) and heat of vaporization (heat required to vaporize a liquid) are determined by the strength of the Intermolecular Forces. Substances with high IMF will have higher melting and boiling points. It will require more energy to break the IMF. Most IMF are weaker than chemical bonds. To break the O-H bond in H2O requires 935 kJ/mol. To break the IMF in ice (heat of fusion) requires 6.02 kJ/mol and to break the remaining IMF in the vaporization of water requires 40.7 kJ/mol. All IMF are electrostatic in nature, the interaction of positive and negative charges. The strength of the IMF will, then, depend on the magnitude of these charges. The strongest IMF is ionic bonding. These are the bonds between metals and non-metals, involving ions. Examples are NaCl and NH4OH. Coulomb's law states that the potential energy, E is proportional to the amplitude of the charges, Q1 and Q2, divided by the distance squared, d2. In salts, there are full positive charges on the cations, which have lost electrons, and full negative charges on the anions, which have gained electrons. One of the defining features of salts is their extremely high melting points. A large amount of energy is required to separate the positive and negative ions from their positions in the crystalline lattice. The next strongest IMF is ion-dipole. This involves the interaction between the full charge of an ion, Q, and the partial charge of a polar compound,m, its dipole moment, E µ Q m/d2. The partial charge on the polar compound is smaller than a full positive or negative charge on ions, so the interaction will not be as strong. Hydration is an example of ion-dipole interactions. NaCl dissolves in water, because the Na+ - Cl- interaction is replaced by the hydration of the ions by the polar water molecules, one full charge, surrounded by many partial charges. These are the interactions that exist between neutral, but polar substances. They involve the attraction of partial positive and partial negative charges present in polar compounds. We can compare the boiling points of two polar compounds, of similar size, chloromethane, CH3Cl and cyanomethane, CH3CN. These are both polar compounds, but the dipole moments, m are different. CH3Cl has a dipole moment of 2 D (debye, the units of polarity), and CH3CN has a dipole moment of 3.9 D. This is because nitrogen is more electronegative than chlorine. This difference in the strength of the IMF leads to a difference in the boiling points of the compounds, CH3Cl boils at 249 K and CH3CN boils at 355 K. For similarly sized molecules, the larger the dipole moment (m) the stronger the IMF. This is a special case of dipole-dipole interactions. The partial positive charge comes from a hydrogen atom bonded to F, O or N. The partial negative charge comes from a lone pair on O, N or F. Shown below are a number of possibilities for hydrogen bonding (----). Because O, N and F are so electronegative, their bonds with H are extremely polar. Because H is small, with no inner core electrons, it has a small, concentrated charge, which can approach the electronegative atom (O, N or F) very closely, making a very strong interaction. The boiling points of hydrogen bonding species are much higher than those of similarly sized molecules that don't exhibit hydrogen bonding, as shown in the plot below. Notice that H2O has a higher b.p. than HF, which is more polarized. This is because water is unique in being able to form four hydrogen bonds per molecule. Hydrogen bonding determines the structure of solid water (ice) making it less dense than liquid water. This means that ice floats, and lakes freeze from the top down. It is the only substance that is less dense as a solid than as a liquid. These are the IMF that exist between non-polar atoms or molecules. Again, they are due to attractions between opposite charges. In this case, the attractive forces are due to instantaneous dipole moments. The picture below represents a "snapshot" of two helium atoms. At this particular instant, both valence electrons on the atom on the right are on the same side of the nucleus. This will create an instantaneous dipole moment in that helium atom. There will be an attraction between this area of negative charge and the nucleus of an adjacent helium atom. In addition, the electrons on the second atom will be repelled by the electrons on the first, and will also form an "induced" dipole in the second atom. The picture on the right shows the induced dipole moments and the attraction between them. These are the London Dispersion Forces. They are instantaneous electrostatic attractions. They are very weak, and only operate over very short distances. The strength of the London Dispersion Forces (LDF) depends on how easily the electron cloud of an atom or molecule can be distorted or polarized. The further from the nucleus that an electron exists, the more loosely it is held and the more polarizable it will be, leading to a stronger LDF. So, the strength of LDF increases with atomic and molecular size. A comparison of the boiling points of the noble gases demonstrates this effect. The strength of the LDF also varies with the shape of molecules. LDF operate over very short distances. The closer molecules can approach each other, the stronger the LDF. We can compare two different compounds that both have the formula C5H10. One is the open chain molecule, pentane, and the other is the branched compound, neo-pentane, both shown below. They possess exactly the same number of electrons and degree of polarizability but the have very different boiling points, indicating very different LDF. If we look at the space filling models, which show the volume occupied by the electrons in the molecules. The pentane molecule is linear in shape. The neo-pentane molecule is more spherical. Shown below are two molecules of each compound, at their closest approach to each other. The linear molecules can approach each other very closely, and along the whole length of the molecule. This increases the strength of the LDF by decreasing the distance between the molecules. The neo-pentane is an almost spherical molecule, that can only make contact over a very limited area. This increases the distance between the partial charges and lowers the strength of the LDF. All atoms and molecules possess LDF, since they all possess electrons. We can compare the boiling points of two polar molecules, HBr and HCl. HCl is more polar, with a larger dipole moment. However, its b.p. (189K) is lower than that of the less polar HBr (206 K). This is due to the LDF. HBr has 36e- and HCl, only 18 e-. Water will "bead-up" on a waxed surface. This is due to the "imbalance" of IMF at the surface of a liquid. In the interior of the liquid, the molecules are surrounded by other, similar molecules, but at the surface they are only attracted to the sides and inward. This works to reduce the surface area, attempting to create the shape with the minimal surface area, a sphere. The surface tension is the amount of energy required to stretch or increase the surface area. Molecules with high IMF also have high surface tensions. The surface tension of mercury is even higher, due to the metallic bonds ("sea" of shared electrons) between atoms. The intermolecular attraction between like molecules is called cohesion. The intermolecular attraction between unlike molecules is called adhesion. Both forces are in play when we look at a comparison of the meniscus shapes of water and mercury. Both liquids have strong cohesive forces (hydrogen bonding and metallic bonding) so both will have rounded shapes. However, water also has adhesive forces with glass. Glass is composed of Si and O. The oxygen in glass can hydrogen bond to water. So, the water level will rise near the glass, due to this attraction, giving a concave profile to the water at the surface. This is also the cause of capillary action, the rise of water in narrow tubes. Mercury has no adhesive forces with glass, so the surface minimizes the exposure to glass by rounding up, and is it not drawn up into the tube.